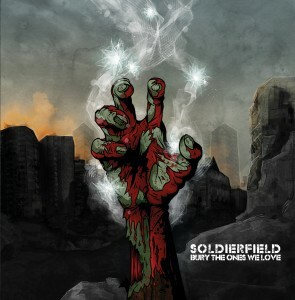 Soldierfield formed in late 2011 and now just a year later are releasing their debut EP - "Bury the ones we love". The various band members have spent time in other bands including Rise to addiction, Blaze, Paradise Lost, and China Beach. This EP certainly makes me look forward to them releasing a full length album. You've got a good solid metal core to the music with rock and prog thrown into the mix, which gives it a nice well rounded but heavy feel. Brief comments on a couple of the tracks.. The EP starts off with the title track - "Bury the Ones We Love". Heavy guitar riffs and powerful vocals make this a definite metal track, but at the same time those rock influences creep in with the big chorus that makes it a song that will appeal to a wide range of people. "Feel alive" is a more commercial song - but still definitely in the metal camp. It's a song I can see going down very well at gigs, and can certainly see it as something that Scuzz etc would play. This is an excellent EP that I definitely recommend that people listen to. I for one look forward to them releasing a full length album. "Bury the ones we love" will be released on 29th October via Metalbox recordings.